Teradata firewall by DataSunrise blocks potentially harmful requests to the database and protects information from hackers aiming at getting access to corporate data. It effectively deals with different types of SQL-injections (including SQLmap protection) and differentiates user access to the database. Teradata firewall by DataSunrise keeps sensitive and other types of critical information protected in real time. It offers reliable protection from both external and internal threats and allows DBAs to gain visibility into database activity and user behavior. It also helps to efficiently maintain regulatory compliance. It continuously monitors incoming and outgoing traffic and filters queries according to the DBA-defined set of rules. The firewall is deployed as a proxy. Residing between a client and the database it intercepts communication between two nodes while performing continuous auditing and logging of user actions and changes made to the database. All suspicious and forbidden requests are blocked. Only explicitly permitted queries are allowed. Continuous scanning and analyzing of traffic ensure prevention of SQL injections in real time. 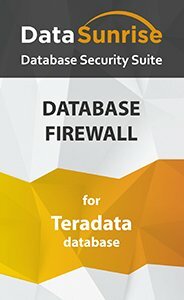 Teradata firewall by DataSunrise blocking mechanisms allows detecting all common SQL Injection techniques, including time delay exploitation, automated exploitation, boolean-based and union-based exploitation. Self-learning mode is activated once the initial deployment. Self-learning makes the customization process easier and quicker and helps to avoid false triggering. The firewall analyzes incoming queries and creates the whitelist of those which are typical and safe in this environment. All the queries which are not in the whitelist, are blocked. After the firewall is deployed and the initial stage of self-learning is over, security rules have to be created. Rule conditions are based on multiple parameters, e.g. database attributes, client application properties, contents of the intercepted queries, etc. The firewall runs transparently and ensures stable protection with minimal influence (less than 1%) on through-put and performance. DataSunrise Database Firewall supports Teradata versions 13, 14, 15 and runs on Windows and Linux.